John Travis 13.53 lbs 2nd Place, Scott Ham 15.21 lbs 1st PLace, Darrel Knies 13.52 lbs 3rd Place and a Big Bass of 5.15 lbs. 1st Place-Ryan Fancher 16.56 lbs 2nd Place, Chris Rush 13.36 lbs 3rd Place-Brent Ausbrook 13.12 lbs 4th Place was Rick Klanke 11.51lbs and a Big Bass of 6.22 lbs was caught by Gruen Vonbeherens. 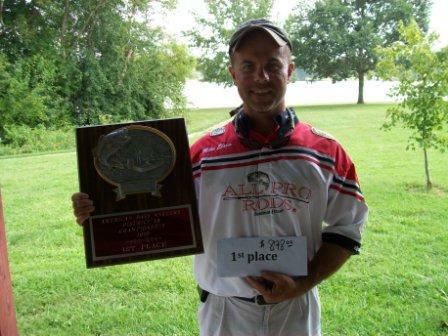 1st Place-Kevin Arbaugh 15.76 lbs 2nd Place, John Pepmeier 10.71 lbs 3rd Place-Mike Campbell 10.61 lbs and a Big Bass of 3.99 lbs was cuaght by Kevin Arbaugh. 1st Place-Brent Budde 14.22 lbs 2nd Place, Ryan Fancher 12.32 lbs 3rd Place-Darrell Knies 11.38 lbs and Big Bass of 5.12 lbs was caught by Mike Campbell. Chris Rush’s 5 bass limit weighed in at a whopping 16.48 lbs. Chris credited his win with his local sponsor – Runyon Oil Tools Second place went to Mike Buchanan with a weight of 14.79 Lbs. Third place was John Jones with a weight of 6.83 lbs. Big bass was also awarded to Chris Rush for catching a 4.94 pound large mouth. Mikie Buchanan’s bass weighed in at 10.81 lbs. 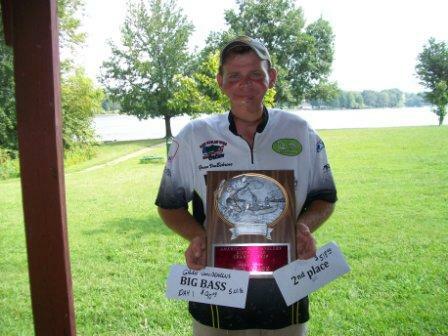 Second place went to Chris Rush with a weight of 9.64 Lbs. 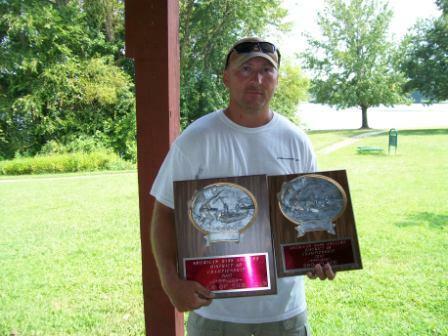 Third place was Dirk Hayward with a weight of 8.41 lbs. Big bass was also awarded to Mike Buchanan for catching a 4.25 pound large mouth.